The Villa itself is extremely spacious and sleeps six people while to the rear of the house is a small cottage, which sleeps a further three, but the accommodations are only available to the same group. Within the grounds too is a covered carport and a very efficient, stone built, covered barbecue. The terrace for eating al fresco is also covered to give shade but looks towards the swimming pool and the sea. Scopello is 3 kilometres away for shopping. The villa with its immaculate white-washed walls with its mixture of cheerful colours terracotta floors is magnificent , with plenty of space and a lovely garden looking down to the sea Light floods in from all angles.There is a covered seating and dining area near the pool plus plenty of sun loungers and umbrellas. The outside area has a large dining area with place for everyone as well as a relaxing area. From the garden entrance to the house a small path leads to the crystal clear waters below where you can snorkel. It is a well-located summer house within easy reach of the beaches, rocky coves, restaurants and shops of Scopello and Castellammare del Golfo. A path leads down to the crystal clear waters below while the coves and bays of the nearby Lo Zingaro Nature Reserve are invitingly close at hand. We rented this villa for the week of Thanksgiving. Our party consisted of two couples and one child. The villa was perfect and beautiful. There are two houses and we ended up having one couple in the main house and one in the guest house but both could have stayed in the main house comfortably. The pool area with outside seating was a great place to relax. The beach was a short walk down the hill and there was a private-ish rocky beach directly in front of the house. Livia was great to work with and very accommodating. The house is on a dirt road that is easy to miss/confuse with a driveway. I highly recommend staying there. It was a wonderful property with plenty of space to spread out. The accommodation was excellent although we spent most of our time on the terrace and in the pool. 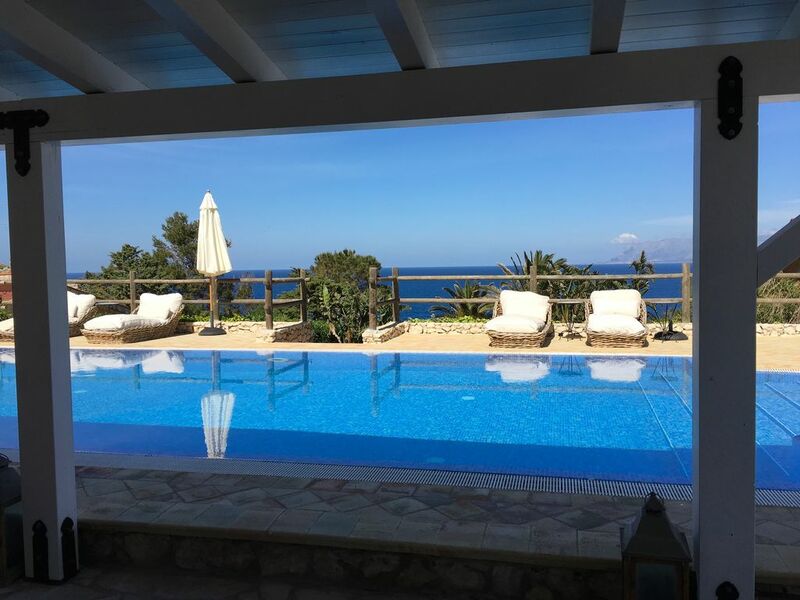 We had an amazing stay at this beautiful villa plenty of room for our family , lovely views and the perfect setting to celebrate our 30th wedding anniversary. Livia was so kind and considerate and the villa was well equipped and catered for all our needs. Great to be only 1/2 hour from the airport , Scopello has lovely restaurants and is very picturesque. Beautiful house and location...highly recommended! We just enjoyed a 10 day family holiday in this beautiful house in a fantastic location! Well appointed large house with perfect outside space (large pool, shaded areas, balcony, beautiful outdoor seating/sunbeds)...and all in a stunning location with panoramic views of the ocean! The surrounding area and coastline are fantastic...numerous small coves and beaches and nearby Zingaro coastal nature reserve. Scopello is a small hill top village a couple of miles away with a couple of lovely restaurants and Catellamare Del Golfo town is close by with beautiful harbour and places to eat. The owners Livia and her husband could not have been more welcoming or helpful. It’s hard to imagine how this villa and it’s location could be improved upon...beautiful place! Villa Livia was all we could have ever hoped for. The house was even more beautiful than showed in picture, well equipped, comfortable, situated in a nice and calm environment, close to Scopello and Castellammare del Golfo. The insides are comfortable, clean... the outsides are slendip, with the most beautiful view and all you could hope for to lounge around! What impressed us the most was the kindness and attention paid by the owners. Livia is an attentive host, always ready to help, give advice, recommandations and is extremely responsive to messages. When our daughter got sick she was there all the way to find us the help and support we needed. We travel a lot and never have we been so pleased. We highly recommend this villa and will be back for sure. We can not thank them enough for making our stay unforgettable! THANK YOU! Livia is the perfect host, and made us feel really welcome. Plenty of space for a large family. Felt really homely, and plenty of accessories and equipment. Haven't felt this relaxed on holiday for many years. Perfect peace and a fantastic view. The small village of Scopello has a good selection of restaurants and bars, and can be reached by car in about 5 minutes. There is also a mini-market (with excellent deli, butcher's and wine selection), a good bar and an organic farm shop selling superb fruit and vegetables about 5 minutes' drive away on the road towards Scopello. The old tuna fishery (tonnara) of Scopello occupies a very suggestive setting, and Lo Zingaro Nature Reserve offers a range of spectacular walks and some beautiful crystal clear bays for swimming. There is a diving centre in Scopello for SCUBA lovers and a pebbly beach with equipped lidos just a 5-minute drive away at Guidaloca. The town of Castellammare a few kilometres up the road has several seafront bars and restaurants and a daily fish market. The spectacular Elymian/Greek site of Segesta is about 30 minutes' drive away and Erice, Palermo, Trapani and Selinunte can all be reached in under an hour.